We have come to the sad conclusion that we can no longer keep our Huntsville location open. We will still be operating our Tullahoma location, so if you get in the mood for a road trip please stop by and see us. We truly appreciate all of the new customers and friends we have made in Huntsville. All outstanding gift cards and coupons will be honored at our Tullahoma store. Until it is packed and moved, we will be running an inventory reduction sale: Machines are 20% off, fabric 30% off, and all sewing cabinets 40% off. Help us not have to move all of this! A big Thank you to all who participated in our 2nd Anniversary. We greatly appreciate your support! 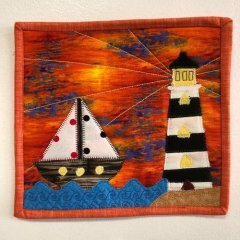 Come try our summer "Open Sew Social". The last one is Friday, August 17. Bring a sewing or embroidery machine, a new or unfinished project, and bring a friend or make some new ones. No lingering projects? Not to worry, we have kits, fabrics and ideas for you. Beverages and lite snacks provided, or bring your own if you prefer. This means we are open 3 extra hours for those with a heavy work schedule.